As part of a walk along the waterfront in San Francisco today, I stopped at TCHO (S.F. chocolate maker) and also at The Plant Cafe Organic. The Plant Cafe specializes in healthy, and local, organic food. 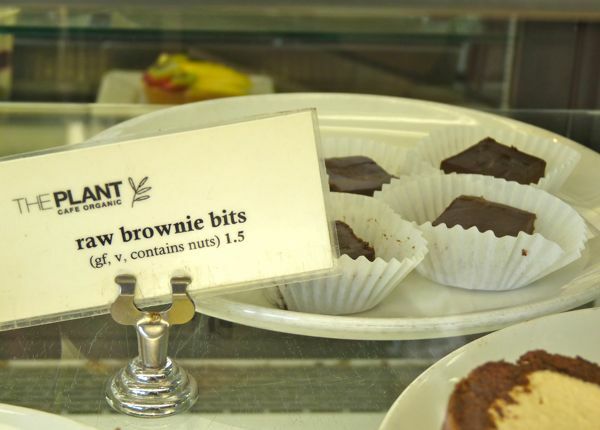 Their menu offered several gluten-free items -- including a raw brownie, and its diminutive cousin, the raw brownie bit/bite-sized square. Thank you to the staff member who pointed out the smaller version. It was the perfect dessert item to follow a great chicken salad I picked up there. 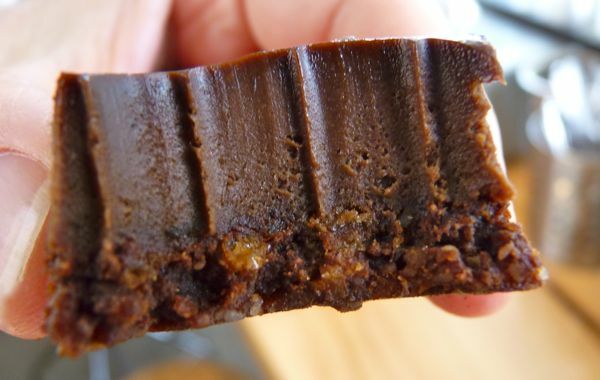 This smooth, creamy, bite-sized chocolatey square, that was sweetened with agave, and also contained finely chopped dates, had a slight coconut taste, and was very satisfying.